Moldavite pendent wrapped with silver wire. As these are natural products stones vary in shape and finish, all pieces are 1cm in size approx. Moldavite is a translucent green gemstone created by a meteor collision with earth nearly 15 million years ago. It fell over what is now called the Moldau River valley in Czechoslovakia. Moldavite is one of the rarest minerals on earth. In legend, it is believed Moldavite was the green stone in the Holy Grail and has the power to quicken one's spiritual evolution. Even people not sensitive to the energies of stones, often feel the energy of Moldavite. Many sense it as heat, tingling or pulsing sensation in their hand. Others feel a rush of energy through thier body, usually upwards out of the top of thier head. 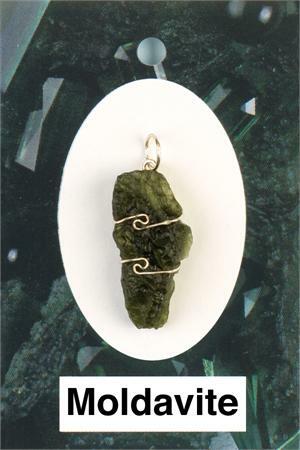 Moldavite's high vibrational energy is a powerful chakra opener, particularly at the heart and above. Sleeping with Moldavite activates the Dream State. Wearing it helps manifest positive life change. The metaphysical properties of Moldavite and all moldavite products have come from people’s intuition. You must use your own discrimination as to what is right and appropriate for you and your awareness.